Ever wonder where your cat goes and what it gets up to? Then you’ve landed on the right webpage! A good cat tracker will help you work out exactly where your cat goes, how long they go there, map their route and potentially much more! What Is A Cat Tracker? 1. GPS or Radio Frequency? Above is a table showing what we believe are the very best three Cat Tracking devices currently available in the UK, our list includes GPS cat collar, tag trackers & radio frequency trackers, each one chosen and reviewed careful by us – you can read our review of each tracker underneath by simply clicking the name of the cat tracking device in the table or you can skip straight to the device you are interested by using one of the links above. If you’re not quite sure which device is the best fit for you please have a quick read through our buyers guide here. The Weenect 2 syncs with the Weenect GPS app which is available on iPhone and Android devices. Map – This shows a simple map interface with your pets location clearly mapped out on it making it easy to find where they are. Compass – Yes you’ve guessed right, this method shows a simple compass showing the direction and distance of your pet. Radar – This is a cool virtual reality type interface (think Pokemon Go), which shows you where your cat is and how far away they are through a camera interface. One of the most unusual features of the Weenect 2 is the fact that it can be used to call your pet! The Weenect 2 uses a microphone and speaker to allow you to call your cat from the app on your phone to calm them down or tell them off for not coming home. The Weenect 2 tracking device communicates with the tracking collar every 30 seconds regardless of how far away your pet is. One of the useful features of the Weenect 2 is that you can get the collar to ring, this is particularly useful if your pet has disappeared within the confines of your home. You can also use this feature to train your cat to come running home when the collar rings. It is the world’s smallest cat tracker weighing only 25grams. Very good battery life lasting 4 days when left in standby mode and it only takes 3 hours to recharge fully. Allows you to set up Geofences so that you can receive alerts if your pet wanders too far. Water resistant casing which will keep the tracking collar fully operational regardless of the weather. A superb tracker that ticks all the boxes doing everything you need and much more! The Tractive is a brilliant cat tracking device which starts at a very reasonable upfront price. The Tractive has all the features you would expect from a good quality digital GPS cat tracker. It has the fencing function which alerts you if your cat strays too far, it also tracks and records your cats adventures and total mileage. One feature unique to the Tractive is it’s ability to award points to your cat, much like the Fitbit, for calories expended, thus allowing cat owners to compete for bragging rights over who has the most physically fit cat! Another unique feature is the variety of different covers available for the tag. Most Trackers only offer one style of tag but the Tractive has a range of different designs. For example some include Swarovski Crystals embedded in them (for the more refined cat!) and others feature camouflage designs and are made from a more hard wearing material to suit more rough and ready cats and dogs! The Tractive also boasts a few extra features that I had never thought of before. One is a clip loss alarm, if the tag is removed from your cat’s collar you will be notified on your phone. Another very handy safety feature is the heat alarm, if the temperature gets too hot for your cat to safely function in your will also be alerted. The tag also has a built in torch which is automatically activated when it gets dark, this makes it much easier to spot your cat when you’re out and about looking for it! A great GPS tracker packed with loads of brilliant features while providing a nice range of different tags for the image conscious cat to choose from plus the fitness points system which will help you keep tabs on your cat’s health. Tractive are also bringing out a new tracking collar (shown above) designed specifically for cats. later this year, you can find out more about it on the Tractive site here. The Tabcat is another Radio Frequency tracker. The stylish trans-receiver and small discreet tags look much better than the chunky Girafus RF model. The tags are the smallest we have seen at 32mm x 6mm making them perfect for any cat regardless of their size. The Tabcat tracker does has a few drawbacks though, the trans-receiver can only pick up signal from the tags if they are within 122 metres. The Tabcat company insist that this will be sufficient, however in my experience it is not uncommon for a cat to travel much further than that if something catches their eye or nose! The tags are also neither waterproof nor water resistant. They do sell additional covers which will protect the tag from water damage but the lack of built-in water resistance does seem like a bit of an oversight. One cool little feature of the Tabcat is that by pressing the button on the Trans-receiver you will make the tag beep. You can easily train your cat to associate that noise with a treat (simply press it and give your cat a treat a few times) so that when they hear the beep they will come running back! This tracker is a lot noisier than a GPS tracker (which uses an app on your phone to locate your cat) as it uses a series of lights and beeps to guide you. The beeps increase in frequency as you get closer to your cat. The Tabcat is a fairly simple system to use which requires very little setup and there is no annual subscription fee to pay as is the case for most GPS tracker devices. Beep sound which you can easily train your cat to respond to. An affordable, stylish and simple Radio Frequency Cat Tracker which gets the job done. Pawtrack have been making tracking collars for cats for over 10 years so they know what they are doing. One of their unique selling points is the fact that they have their GPS on the back of the neck, rather than slung under the cat’s chin as they commonly are with so many trackers. This makes a crucial difference when it comes to accuracy, as the GPS antenna is facing the sky to help get the best positions possible and ensure that they will get as much signal as possible. • Automated tracking – every 6 minutes (and on demand) to help show what your cat gets up to at night, and helping you build up an overall idea of your cat’s behaviour. • Integrated wifi chip – This recognises home wifi and send you a notification when your cat comes or leaves home. It also shuts down the collar at home to help conserve battery. • Comes with 2 detachable rechargeable collars – for a quick change over and constant tracking. The collar comes with an app, and multiple users can log into the same account. The app itself has lots of great features: there are the usual geofence and low battery alerts, but there are heat maps, animated playbacks and path drawings showing all that your cat gets up to. You can see up to a month’s tracking on your screen. The wifi feature lets you know when your cat arrives and leaves home. For those more technically minded you can send a .csv with all your cats’ data and GPS positions on it. For Android users there is an additional feature of a wifi beacon in case your collar is lost, it will help guide you in by turning the collar into a min wifi hub. The collar weighs just 32g (1 oz)and has a safety enabled latch. Visit thepawtracker.com and use coupon code Tux2 to get 2 months of free tracking! Built for cats, and cats only, a lot of thought has gone into making this one of the smallest, sleekest collars on the market; Wifi enabled and full of features. The table below features the best of the rest which weren’t mentioned in our top four table. There are some great contenders in here so do have a good look through and let us know which one you go for. Please note we haven’t included the Pod 3 or Pod 2 trackers in this table as they are unavailable to purchase at the moment due to the company going into administration. The Novita Kippy life GPS tracker is a full bells and whistles GPS tracker that does everything you need a tracker to do and far more. You can locate your pet anywhere at anytime by using the mobile or desktop app which gives real time tracking (not ten minute location updates as some trackers do). One of the problems with real time location tracking is that the battery is liable to run out quite quickly however Novita promise that their rechargeable batteries should last up to 20 days, though tests show that 16-17 days is a more realistic battery lifespan for an active pet. One of the downsides to this tracker is that due to the power demands of live location tracking the batteries are quite large and therefore the tag is fairly bulky weighing 50 grams and measuring 60mm x 30mm x 20mm so this may not be suitable for a small cat but shouldn’t be a problem for a bigger cat. One of the best features of the water resistant Novita Kippy Life Tracker is that it allows you to setup a virtual fence. To do this you just need to mark out an area of the map on the app, when your cat leaves that area you will receive an instant alert on your phone. You can track multiple pets using this tracker and can actually setup different virtual fences for different pets (it may be useful to have a close one setup for your dog and a further one setup for your cat). You can also see your cats location history using the Novita Kippy Life app, which will give you a detailed map showing exactly where your cat has been exploring and where it’s favourite spots are. It also allows you to track how much activity your cat has done (as in how many miles/kilometres a day your cat has travelled and estimated calories burnt), so if your vet has told you that your cat requires more exercise this is the perfect app to use to ensure that your cat gets in shape! The tech lovers out there will also be pleased to know that the Novita Kippy Life uses clever telephone signalling triangulation methods to locate your pet when GPS signal is unavailable so even if the GPS let’s you will still be able to find your cat! Calorie expenditure tracking Possibly too big for smaller cats to carry comfortably. A brilliant GPS tracker which will give you more insight into your cats life than you know what to do with! This Product is currently unavailable for purchase due to company going into administration – we suggest trying the Weenect instead. The long-anticipated Pod 3 tracker is finally here. At first glance it looks like they have done a great job of bringing all the best features we have seen across the spectrum of different cat trackers and combining them into one market-leading device. The Pod 3 is being marketed as more than just a pet tracker, it can also be used for tracking pretty much anything that you can attach it too. The Pod 3 uses GPS, Wi-Fi, Bluetooth and even mobile connectivity meaning that it will always be discoverable providing the battery hasn’t run out! Before I get onto what is so great about this tracker let me first mention the one thing that may make you think twice about buying the Pod 3. This is their subscription fees. While not extortionate paying for the data tracking services will cost you an extra £49 a year or £6.95 a month (the first three months are free). I consider that a small price to pay to keep your pet safe with what is undoubtedly the best tracker in the business. Pod are known innovators in the cat tracking industry as we saw with the Pod 2. The Pod 3 is fully waterproof, boasts 24-hour historical location tracking, works for both indoor and outdoor tracking with its four layer system (the layers comprising of GPS, Wi-Fi, Bluetooth and mobile connectivity) as well as having a health and fitness monitoring system built in. It really brings everything you would expect from a top rate tracker together and then, just when you think you’ve got it all it gives you even more! You guessed it, it’s a torch! If your cat, dog, or whatever else you choose to attach it too, is in the habit of wandering into dark places then this would be ideal for them, you can turn the light on from your phone in order to help you easily locate them in the dark. The power dock unit provides you with a USB port which you can use to attach the Pod to an external battery if you are looking for extra long battery life. This could be particularly useful if you wish to use the Pod on a vehicle as you can plug it directly into your USB port and not have to worry about the battery ever running out. This module is (obviously) an extra battery which will significantly improve the battery life of your Pod 3 so that it can last up to a colossal five days without being charged – that’s a lot of time for a tracker with this many features! This module can produce an audible beep at the touch of a button, the beep is as loud as 90 dB which should easily be audible from 30meters away making it easy to work out where your cat is at. This module emits a high-frequency noise which humans will be unable to hear but pets, including your cat, will hear it instantly. You can easily train your cat to associate this noise with a treat or meal times so that as so as your cat hears it they will come running back home. Interchangeable modules £49 a year or £6.95 a month subscription cost (after the first three months). Ability to create multiple safe zones. Has all the top features you'd expect of a top of the range tracking device and more! If you want to own the best pet tracker on the market then this is the tracker to buy. It improves on the already superb Pod 2 by adding in a range of interchangeable mods to suit your cat. Buy this and you won’t be disappointed! Pod is a stylish tracking brand which is the result of a successful Indiegogo campaign from early 2016 which was launched when the founder of the Pod company lost his dog. A compelling story but one wonders why he didn’t just use one of the already existing pet trackers on the market. Anyway the guys behind the Pod 2 believe they have created a market leading device which beats every other pet tracker, we will let you make your own mind up though. This is the 2nd generation of Pod trackers and it’s definitely one of the best smart trackers available. One of the great things about the Pod 2 tracker is that the team behind it are very pro-active and are constantly looking for ways to improve and develop their tracking device as you will see if you look at all the great new features in the Pod3 which is out now – the great news is that anyone who has purchased a Pod 2 will get a 30% discount on the new Pod tracker – click here to find out how to claim your discount. At only 29 grams it is significantly lighter than it’s closest rivals. It is more or less the same sort of size as rival tracking tags at 23mm x 50mm. As with many of the leading cat tracking devices that is a bit bigger than is ideal for small cats. Some smaller cat owners who have used this reported that it got snagged in foliage and the cat slipped its collar (at least they’re easy to find though). The cylindrical shape is a step away from the traditional rectangular tag. The shape minimises uncomfortable corners for your cat to potentially hurt themselves on if they were to fall awkwardly. A cool feature that rivals didn’t think of was Wifi connectivity, the Pod 2 tracker can connect to your Wifi when your cat is at home. This allows for much more accurate location tracking which makes it very easy to find your cat when it has disappeared behind or beneath a piece of furniture in your house! This cat tracker also provides plenty of data on the mileage your cat has covered, calories burnt and even what speeds your cat is travelling at! There is a rolling fee with the Pod 2 cat tracker as they have a Global Telco deal with Vodafone (meaning that you can use the cat tracker it any country in the world where you can get signal) however this means that there is a £29 per year charge which you are free to cancel at any time. The Lithium Polymer battery should last up to 5 days. Two batteries are provided so that while one is charging you can still track your cat. A small docking bay is provided which plugs into a USB port to allow you to charge the batteries, the batteries should charge fully within two hours. The Pod 2 app is available on iPhone, Android and Windows Phone. No annual fees for first year after purchase. 30% discount on future models for all existing users. Find out more here. 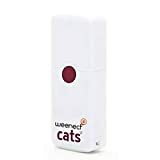 A high end innovative cat tracker which provides tons of data and is purrfect for cats who often go missing inside your own home aswell as outside, not the cheapest but if you want a reliable tracker with all the bells and whistles then this is very much the one to go for! The Girafus Pro-Track-tor is a great alternative to more expensive GPS trackers. The Girafus Cat Tracker uses Radio Frequency signals which your receiver box interprets to work out how far away your cat is and which direction the signals are coming from. One of the best things about Radio Frequency trackers is that there are no monthly fees that are common with GPS trackers. as most cats wont travel more than 500m from their home, however if your cat is particularly adventurous then a GPS tracker would be a more suitable choice. If however you would rather avoid the monthly fees of GPS trackers but would still like to gather some data on what your cat gets up to then we recommend that you pair a Radio Frequency Tracker with a bluetooth activity tracker such as the PetKit Cat activity Monitor. You can track up to four cats using the Girafus tracking device however you will have to buy additional tags for each of your cat, it is best to buy four at once as there are significant discounts for bulk buying them together, whereas if you buy them individually you can pay up to £25 per tag. This is one of the lighter clip-on cat trackers, with the tags weighing only 4.2 grams your cat shouldn’t be bothered by the additional weight. Although the tags are very light they are larger than you would expect and can look quite cumbersome on a smaller cat, they measure 28mm by 38mm so aren’t particularly discreet. The Girafus Tracker is very much a plug and play device requiring next to no setup, just clip the tag to your cat’s collar, turn on the tracking device and you are good to go! It is also splash proof so will be fine if your cat gets caught in the rain. It is not water-proof, but we all know cat’s hate swimming so that won’t be a problem! An affordable alternative to pricey GPS trackers. Trax is one of the smaller tracking devices on the market weighing only 27 grams and measuring a diminutive 54mm x 38mm x 10mm it is perfect for small cats. Trax is a real time tracker which comes with a built in SIM card that has two years of free data and data roaming on it, after two years of use a small rolling annual fee is required to keep it running. Trax works in over 30 countries and is one of the more durable tracking tags as it is water resistant and copes well in hot climates too. The Trax app interface is very easy to use and easily connects to your Trax tag with no problems. The Trax app incorporates a few cool features which we haven’t seen on other cat tracking apps. One of these is augmented reality, the app will use your camera phone (a bit like Pokemon Go) to overlay directions onto your surroundings and indicate how far away your cat is. Perhaps the only downside to this tracker is the battery life seems to be much shorter than on comparable trackers, often only lasting for a couple of days. This is probably the reason why it is so small as I imagine they have put a smaller battery in it in order to save on space. The app has all the features you would expect from a smartphone tracking app including Geo-fencing. Their Geo-fencing also includes a scheduling feature so that you can turn your fences on or off at different times. For example if your cat is supposed to stay in the house whole you are at work you can set up alerts for if your cat leaves the house and then schedule that Geo-fence to turn off when you return home. Another interesting feature of the Trax phone app is that it allows you to set up speed alerts. Part of the reason for this is that this tag can also be used for tracking children and parents may wish to set up alerts if their child suddenly gets into a car, this feature could be useful if you are particularly paranoid about a potential cat-napping! Probably the smallest Tracker we have seen, featuring a great app packed with tons of great features, the limited battery life is the only thing letting this Tracker down. The TK Star GPS Tracker comes built into a pre-existing collar which is available in six different colours (orange, yellow, blue, black, green and red). Because it is designed and shaped to fit around the collar it seems to hide it’s size better than other tracking tags. The tracker unit is 70 mm x 37 mm x 20 mm and weighs 45 grams (excluding the weight of the collar). As with most smart location trackers there is an annual fee to cover the cost of the SIM card data which is used for the GPRS service. The tracker requires a standard sized SIMcard. The Tracking App (TKStar GPS Tracker Mobile App) is currently only available on the App store of the Google App store so you will require an iPhone or an Android phone. The app has a lot of features which will be familiar to cat tracker users such as the geo-fencing features. As well as real-time tracking. The real-time tracking isn’t quite as live as other real-time trackers but rather updates it’s location every two minutes, this does however have the benefit of saving battery and with care the battery can last up to ten days if you make use of the sleep mode when you don’t need to track your cat’s whereabouts. The stand out feature of this cat tracker is that it has a call in function which allows you to call the tracker and listen in to what is going on wherever your cat is! Another useful feature of this device is that if you have no mobile data available you can instead text the tracker and it will send you back coordinates to its location. The call in feature alone makes this tracker well worth the money! The final few trackers are in our table below. Weighing only 12 grams and measuring 3.5cm x 1.5cm x 1cm, this tiny tracker packs serious punch for something so small. Apparently it is so small that a pigeon can wear it and fly with it comfortably, so your cat shouldn’t have any problem carrying it around! Before we delve any further into this tracker it is important to notice that this tracker only shows your where your cat has been retrospectively. What this means is that you cant access live data on your phone or computer showing you where your cat is right now you can only see where your cat has been when it comes back and you plug the device into your computer. Consequently this may not be the best tracker for cat owners who want up to date data on their cats whereabouts, however if you are simply curious as to what your cat gets up to in it’s free time then this is a very good option which is very affordable and has no ongoing fees as it works purely with GPS and requires no SIM card. The G-Paw device comes with 2 plastic containers and a USB cable. The two plastic containers and blue (for dogs) and orange (for cats). They both attach in different ways with velcro straps which are pushed through the containers. These are carefully considered so that they are as unobtrusive as possible for your dog or cat. The software for this device is installed on your computer and will be downloaded onto your computer automatically from the device when you plug it in using the provided USB cable. To see what your pet has been up to simply plug the device back into the computer after your pet has been on it’s adventure and the data will be uploaded onto your computer in the form of a map with a clear path of exactly where you cat has been. Charging on this device takes around three hours and the battery typically doesn’t last for more than 5 or 6 hours of constant use. Cheap activity monitor. You can only see where your cat has been when it comes back and you upload the data to your computer. Very small and lightweight. Very limited battery life. A great purchase for someone who has an interest in what their cat gets up to in it’s free time but isn’t too worried about where their cat is right now! Before we get started on this one it is important to first draw attention to the fact that this is not a GPS tracker but rather a pet activity tracker so if your pet goes missing this won’t be much use. When your pet returns you will be able to download plenty of data about what they have been up to via bluetooth to your phone. The Petkit Activity is an affordable starter tracker for anyone looking to get into cat activity tracking, the mobile Petkit app (available on iOS and Android) has a great user interface which also includes a chat option so you can chat option so you can chat directly with customer service staff from the app if you are having any technical problems with it. The interface is very simple to understand and navigate around a and has clear metric tracking functions which can give you loads of data on what exactly your cat is doing. It can track the amount of sleep, calories burnt and general activity levels of your cat as well as being able to provide a rough measure of your cat’s overall health and estimated mood. The collar tag itself is quite small weighing only 8 grams and at 31mm (diameter) x 8.9mm (thickness) it attaches nicely onto the collar like a name tag, the tags are available in either white or pink and is waterproof and dust-proof. As this is not an actual tracker but rather a statistics recorder it could be a good affordable piece of kit to accompany a radio frequency tracker to provide all the data that you don’t get with that type of tracker. This isn’t a location tracking device but rather an activity tracker, as such it would make a great purchase for anyone who currently uses a Radio Frequency cat tracker as it will provide you with stats about your cats behaviour which you wouldn’t otherwise get…and at a very reasonable price too! Weighing in at 150 grams this tracker is a bit of a monster compared to some of the more dainty products we feature on this page. However we have decided to include it because although it is unsuitable for all but the biggest of cats it is a very reliable tracker which offers a lot of features at a very low cost when compared with it’s closest rivals, and one of the great benefits of having a much larger tracker is that it is capable of storing a much larger battery, this means that the Pyrus tracker can happily go a whole week without requiring a recharge – significantly better than the battery life of a mobile app based tracker . Measuring 8.5cm x 5.5cm x 12 cm it is much bigger than most products on the market and it perhaps best attached to your cat via a harness as it may be quite cumbersome if carried around the neck. 2. Open the back of the Pyrus tracker, and write down the ID Number you find there. 3. Put in the SIM card and turn on the tracker. 5. Sent a text from your phone to the Pyrus tracker SIM card. 6. Download the Aibeile app onto your phone (available for iPhone and Android devices). 8. Turn on the app and put in the device ID you recorded earlier. In order to get this tracker to share its location with you all you have to do is then call the SIM card you have installed and you will receive a Google maps location of where your cat is. The mapping on this tracker is particularly accurate and is usually within 15 feet of the exact location. The app also allows for mapping and location fencing to be setup which are features you would normally not expect at this sort of price point. Very affordable. It is HUGE. Too big to be worn on the collar. Very good battery life. Only requires charging once a week. A very affordable tracker which offers a lot of functionality for it’s diminutive price tag, unfortunately the tracker itself is anything but diminutive so it should only be used on the biggest of cats and should be installed on a harness rather than a collar. While this tracker has been marketed as more of an all around tracker (for your keys and wallet) it can also be used for tracking your cat. At only 31mm x 3.5mm it is roughly the size of a £2 coin making it one of the smallest tracking tags we have seen. This tracker has a few unique features including the ability to setup an alert on your phone if you leave the house without the tag, obviously this is a useful feature for your phone or keys but maybe not so useful for a cat as you may not wish to take your cat to work everyday! It also features a phone finder so that you can press the tag and your phone will ring, again not a feature that comes in particularly useful for tracking your cat but I thought it was worth mentioning! The TrackR Bravo Tracker makes use of a fairly simple app which indicates roughly how close you are to your lost cat (or item) via a hotter or colder interface rather than exact location mapping. This system doesn’t have any annual fee as it does not require a SIMcard nor does it make use of GPS tracking but instead works via Bluetooth. This is fine when you are in the house looking for your cat however when you are outside it then uses a system whereby the tag will connect to the Bluetooth of anyone who happens to use the same TrackR Bravo app and alert you to its location through the app. This is potentially quite limiting particularly if you live in an area with a low population density as the chances of someone who is using the app walking past your cat are fairly low, also the app will only give you the last recorded location of your cat so by the time you get there chances are your cat will have moved on. At the moment it is difficult to recommend this tracking device for anything other than finding your cat inside your own home but if that’s all you want it for then it is certainly up to the job! There are a number of important factors to consider when looking to purchase a cat tracking device. A cat tracker is a piece of technology which sends out signals which communicate your cat’s location. A cat tracker will typically use either radio, GPS or mobile data to send their signals back to the receiver. Cat trackers often use mobile phone apps which receive the signal as mobile data and allow you to view you cat’s live location on a map and record their location history. Cat trackers either clip onto your cats collar or they will be built into a pre-existing collar themselves which can be easily fitted around your cats neck. Radio Frequency trackers are much simpler and therefore much cheaper to both purchase and run, requiring no annual fees (as is common with GPS trackers). They are limited in that they provide pretty much none of the trackable data which you get in abundance with GPS trackers. GPS trackers allow you to record all of your cat’s activity from the convenience of your phone. If you’re not fussed about having tons of data about what your cat does and where exactly he goes then a Radio Frequency tracker would be the logical choice. If you like to have loads of data and like to be able to pin-point the exact location of your cat at any given moment then you should definitely invest in a GPS tracker. There is a surprisingly large amount of variety in the battery life of different trackers, particular with the GPS trackers which record a lot of data. Some of the smaller trackers struggle to make it through a day without a recharge whereas bigger versions (presumably with bigger batteries) will happily last up to ten days. If you can’t be bothered perpetually charging yet another electronic device then make sure you opt for a tracker which isn’t quite as energy hungry! Pro-tip; Radio Frequency trackers use significantly less battery (they last for weeks!). Most GPS trackers make use of mobile apps for ease of use. Some apps offer very basic functions such as location updates every two minutes and nothing else! Whereas more advanced apps such as the Tractive have a huge array of functions including virtual fencing, calorie tracking, distance covered, top speed and more! Don’t make the mistake of presuming that just because the tracker you bought has an app it is going to be able to do everything you could ever dream of, do your research first and make sure the app has all you need. Most apps can be downloaded from the app store or Google play before you purchase a device so it is a good idea to do this before investing to allow you to get a feel for the functions and usability of the device. Some cat tracking devices have geo-fencing features enabled. This allows you to effectively draw a virtual fence around your home. If your cat then strays beyond this fence you will be alerted via the phone app. You can expect to pay between £60 – £150 upfront for a good Tracker depending on what you are looking for. However it is important to remember that most GPS trackers will charge an annual (or sometimes monthly fee) for mobile data usage, this can add up and easily add £30-£50 per year to your initial cost. There is a vast range in size differences from one tracker to another. The smallest tracker featured on this page weighs only 4.2 grams, while the biggest weighs 50 grams. Most cats won’t notice 50 grams however if your cat is particularly small or young the bigger 50-gram tracker may obstruct your cat’s freedom of movement to a small extent. Small is always better for the cat, but the problem with a small tracker is that battery life tends to rapidly diminish with size so it may be worth going for a slightly bigger tracker in order to reduce the amount of charging you will have to do. All of the devices we have looked at on this page bring different things to the cat tracking table however we are already looking forward to the future of cat tracking and will be certain to keep this article updated with new devices and new innovations available in the UK’s cat tracking industry. Significantly smaller tracking tags – The Trax is a reasonable size (due to its small battery) but most of the other trackers are quite bulky. Longer battery life, as with mobile phones battery life on these things quickly drains, particularly on the trackers which use mobile apps, even the more efficient ones rarely promise much more than ten days of battery life before a recharge is required. In-built cameras. One or two trackers have experimented with this but none have had a good go at doing a great job of it. We have reviewed a few home cat cameras many of which also dispense treats but it would be great if more trackers were willing to incorporate a camera into their tracking devices. We would love to see a feature whereby you can turn the camera on from your phone and see what the cat can see live. Thanks for reading our guide! If you have any questions at all about any of the tracker devices listed here or any suggestions as to new trackers which should be added please do leave a comment or get in touch via the contact form and I will be very happy to help. Our cat goes missing for days or even weeks at a time. Which one has the longest battery life? ( Though I guess if we can find her she won’t be gone that long!) We tries a tracker by Pawtrax called Halo, not on your site, but we’ve tried 2 and had to send back as neither worked properly. Thank you for the review. Its good to have info on functionality etc but one thing lacking is how much they weigh and the size of them. This is very important when deciding on what to buy. I’d prefer one that isn’t going to impede my cats too much, some seem to do this from the pictures. Would it be possible to give this info in yur next update. Thanks for visiting our site 5 cat lady! We do actually talk about their size and weight in every one of our reviews however I appreciate it’s not very easy to find that information as there is a whole lot of text to read through on this page! When I get the chance I will update the tables at the bottom to include it. Thanks for the suggestion. Not sure if I’m being a bit blonde, but the Weenect – I don’t understand about the SIM card. Does it mean that to track Lily I would have to remove the SIM from my phone and replace with theirs? I travel a fair bit and this would be a nightmare for my kitty sitters, so I’m leaning towards the Tabcat. George went missing two years ago, Ethel is currently missing. Hence why Lily needs some sort of tracker! So glad I found your reviews, any advice greatly appreciated. No you wouldn’t need to use the SIM from your phone you would just need a seperate SIM in the Weenect to allow it to use mobile data and communicate with the app on your phone. I’m a big fan of the tabcat too the radio tracker works very well and is ideal for anyone wh isn’t too concerned about having data on every aspect of their cat’s life all the time, if you’re happy juist knowing that should you need to you can track down your cat with it then the Tabcat is a nice easy to use choice. Good article. Not sure what date your original review article was… do you update and revise the article and ratings based on some of the feedback people have given since? Or is a new review article in the offing? I see Pet Tracer not covered – it’s now on sale apparently and two years ago was regarded as highly promising. Live in London and our cats only go out the back – a maze of rear gardens belonging to terraced or detached houses but none with any side access, so it’s relatively safe. Want to get a tracker that can pinpoint whose garden our two cats are in. Have one unpleasant neighbour who has threatened them and so good accurate information is desirable. GPS or other signal is therefore important as it would be impossible to go out searching for them with a radio signal device. Mobile signal is poor, but I’m with EE and other networks might be better. Which device do you reckon is currently best bet? glad you like the article, we update it every few months, it’s due an update now actually as there are one or two new products on the market that we intend to add. I’m not familiar with the Pet Tracer but I will have a look. Exact location tracking can be difficult down allies so your best bet is a tracker which utilises as many tracking methods as possible to get the most accurate data. Personally I would recommend the Tractive as this uses both GPS and mobile data so should give about as accurate a reading as possible. Hope that helps! I’m in the market for a decent cat tracker. I’d want real-time GPS tracking and to be able to view recorded movements within a mobile app. My main concern is the size of the tracker, as little Cuthbert doesn’t like anything too bulky hanging around his neck. He is also a serial collar loser, so I’d need to be able to locate the device if necessary. What would you recommend? Thanks. P.S. Great site, keep up the good work! Hi, why isn’t there a gps chip that you can insert like the microchip.. ? For cats that don’t like collars! Hi Louise, it would be great if that existed. Unfortunately battery power is required to transmit a GPS signal so you would also have to find some way to power it from underneath the skin…maybe one day in the future..! Hi Dan, I have bought the Pod 3 for my cat and I can’t for the life of me get it to work. I cannot seem to connect it to the network, I usually have no problem with my network even though it says between 1 and 3 our of 4 bars usually and have taken the advice of the Pod 3 help team but no matter how many times I try, I can’t connect it. Have you heard of any similar problems? For the expensive price of the POD 3 am not happy it’s so difficult to use. Lookinga t some reviews, I’m not the only one and even heard some are only compatible with US networks! Hi Deborah, sorry that you’re having trouble with the Pod 3. It sounds to me like you have been sold a faulty product. If I were you I would get in touch and request an exchange…when they work they are definitely one of the best trackers on the market! Sorry you’ve had trouble with it, do let us know how you get on. I prefer to use a GPS tracker with Geofence feature because i am busy at work and my cat is free whether it is inside or outside of our house. By the way thank you for sharing this blog to us cat lovers. Geofences are great aren’t they? glad you like the blog Shirley, thanks for visiting. Looking for a pet tracker for my 4 cats. Can only see 2 trackers on your list with multiple pet tracking. Would you recommend the Tabcat or the Girafus? I know you have the Tabcat in your Top 4 list but the reviews on Amazon aren’t great. They are all neutered so shouldn’t stray too far but still concerned about the Tabcat only being able to track for 122 metres. However it seems smaller and less cumbersome than the Girafus so would be inclined to go with that one. But then the Girafus has GPS and a mobile app whereas Tabcat doesn’t. I’m in a rural location. Any advice would be appreciated. Thanks for stopping by, sounds like you have quite a handful of cats there! I’ve just noticed that Tractive have updated their app now so you can track multiple cats on it if you have more than one of their trackers (I’ve updated the table too). Although the Amazon reviews for the Tabcat aren’t great I personally am a big fan of it and think it’s a great option if you aren’t bothered about having the app for them. Not many cats ever seem to go out of range on it despite its limited range! The Girafus is also a good option though can be a bit too bulky for some smaller cats. I have three cats and currently use the Tabcat tracker which is great if they are within range, which they usually are. My cats even usually come home when I do turn the tracker on and give them a beep. However, my 11month old cat went walkabout this weekend and was missing for 26 hours, he was found approx. 1 mile away from home. As he was out of the Tabcat tracking range of 122 metres a local Cat Networking Organisation who are on Facebook (I’m not) helped me to find his exact location by putting out an alert with picture and fortunately someone telephoned in to say they he had seen him at 6.00am that morning. I was then able to go to the location with my Tabcat. He was eventually found at a Riding School in a field full of horses hiding amongst bushes and trees. I would never have been able to pinpoint his exact location in this huge field if I hadn’t had the Tabcat tracker. So I cannot fault the Tabcat, I change the batteries in both the handset and the collar buttons every 5 months however I must say that I wore out the battery in the handset twice over this weekend because of the amount of continuous use during this time of intense tracking. Quite often my cats come home having lost their collar and tracker button and I have been able to go out and track the collar and have successfully retrieved them each time. Because of the distance my cat travelled on this occasion I am also looking into purchasing a GPS tracker for my naughty kitten in case he goes walkabouts again. Hope this info helps you. I have a cat and have been using the track active. For a while now however we live behind a train line and the cat has now lost the device twice the second time is somewhere we cannot get out so it is now lost. I like the track active as if he has been out a while I can flick up the app and see where he is but the issues with the clip coming off is a real problem. What else would people suggest that is similar ! I would recommend the Tractive which features a clip loss alarm so you know when it has come off your cat. Tractive are also bringing out a new tracker in the next few months which is built into a collar so in theory should be much harder to lose so it may be worth waiting for that. The TK Star is also a good option which is underrated in my opinion. It is built into a collar so again is harder to lose. Both of these feature app integration which gives you all the data you need. Looking at the comparison table, it shows there are really a lot of good products to monitor my feline pet. It helped me narrow my choices down. There’s certainly a lot of choice, which one did you choose in the end? Thank you for this list! I’m glad you’ve posted about this. By the way do you still have any suggestion on trackers that already uses 3G? Thanks! Hi Janica, glad you like our page. A lot of these trackers do use 3G too. In stock trackers mentioned on our page that use mobile data include: the Pod 3, Weenect, Tractive, Novita, Trax, TKStar, Gpaws & Petkit…in fact pretty much all of them except for the radio trackers! My ginger cat just disappears and shows whenever she like, that is why I badly need a pet tracker. I’m looking for a device with geofencing capabilities thanks for this list. The Pod 3, Tractive, Novita, Pod 2 and TK Star trackers all have geofencing capability. Click here to go back to our table of cat trackers.